On Saturday we should see a picture similar to this, Donald James MacPhee welcoming the walkers for the first walk of the week on Islay. The picture was taken in Ballygrant a few years ago, this year we will meet at the Gaelic College in Bowmore for the first walk. I've written about some of the walks and in particular the ones I'm planning to join in the WalkIslay 2010 Islay Walking Week Preview. For the full programme go to the WalkIslay website or try the WalkIslay 2010 Illustrated Programme. I don't know how much time (and opportunity) I'll have to blog over the next few days as well as during WalkIslay. I'll try my best to update you somehow. The most likely place will be my Isle of Islay account on Posterous, followed by the Islay Pictures photoblog. Once I'm back I'll update you here again. I think that's about it. Hopefully see at least some of you on Islay. Late breaking news: Just received an update that the Calmac ferry from Islay to Colonsay has been cancelled for next week, meaning the planned walk from Colonsay to Oronsay will have to be cancelled. 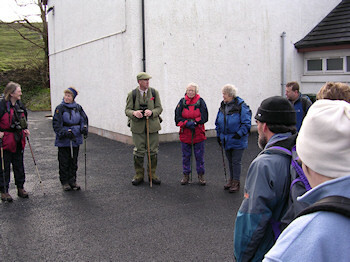 There will be another walk (most likely on Islay), planning is under way. As soon as I know anything I'll try to publish an update, either in the comments here or on my Isle of Islay account on Posterous. Or both.